Humble nylon monofilament has been around for a long time, and chances are, you started fishing with it before you switched to fancier braided lines or fluorocarbon. It’s an unfortunate truth that many anglers now sneer at mono as an inferior product. We’re not convinced that they should, and we’d like to explain why. Nylon monofilament offers awesome shock strength, easy tying, superior knot integrity, low-visibility, and plenty of give to prevent line breakage or hook throwing. It’s also far more abrasion resistant than you might believe. What’s not to like about that? But assessing whether you should give mono another try is complicated. And given the huge range of brands available, it can be difficult to choose the right one for you. We’d like to help, so keep reading! We’ll explain the details of mono, dispel some myths about the fishing line, and review a few of our favorites. Stren Original – Our Pick! 1 Why Choose Monofilament Fishing Line? 2.1 Stren Original – Our Pick! 3 Our Pick – Stren Original! Why Choose Monofilament Fishing Line? Standard monofilament is composed of a single strand of blended nylon polymers. The precise mix of these, and the addition of any coating, is much of what separates one brand from another. But generally speaking, nylon monofilament is formulated to provide high shock strength, excellent knotability, and low-visibility. And as line technology has improved over the years, mono has only gotten better. Stretch – The nylon polymers that are used in monofilament are quite elastic, and they’ll stretch under load–sometimes by as much as 25 percent! While the exact amount of stretch varies from brand to brand, diameter to diameter, and wet to dry, nylon mono stretches a lot more than braid, and roughly as much as fluorocarbon. This stretch can be a lifesaver when a big fish hits your line hard. Effectively acting as a shock absorber, the give in mono prevents all of that stress from transferring to your knots and causing a failure at the line’s weakest point. It’s also more forgiving for tender-mouthed fish like crappie as well, and that stretch makes it an excellent choice for treble-hooked lures, top water, and aggressive fighters like largemouth. The lack of stretch in braid, while advantageous in some circumstances, is a liability in a hard fight, especially when a fish shakes its head to throw the lure. The extra cushion of mono helps keep those hooks where they need to be. Low and high-visibility options– Nylon mono is easy to dye, and as a result, it’s usually available in a variety of long-wearing colors to match your conditions. And for those who fish with techniques that demand easy-to-see line, like nymphing, mono is often offered in bright yellow and other high-vis colors. Even night anglers can find something to love, as many brands offer fluorescent line that glows in blacklight for easy handling. In terms of invisibility to fish, our research reveals that nylon monofilament is as low-vis in water as fluorocarbon is. That’s probably a shock to many of you, and it was to us, too! That’s obviously only one video testing one brand against another, but there’s a lot more where that came from. We’ve done our homework, and we’re not convinced that mono is inferior to fluorocarbon in this respect. Superior abrasion resistance – Another shocking fact about mono is that it’s very abrasion resistant when compared to braid and fluorocarbon. That stands to reason: nylon is pretty tough material and it’s forgiving of tiny scratches and nicks. Diameter to diameter, repeated testing shows that nylon mono will outperform even fluorocarbon! To be fair, this is one brand in one test–this isn’t science! SaltStrong repeated this test with wet mono as well, and the result was identical. While not conclusive, it does demonstrate something you should know about mono: it’s far more abrasion-resistant than you might expect. Knot friendly– Monofilament is very easy to tie and generally superior to braid and fluoro in terms of knot strength. While there are exceptions for some fluoro lines, it’s fair to say that mono enjoys a huge advantage in this respect. For instance, when TackleTour tested the knot strength of average mono like Trilene XL, they found that it was exceptional: line verified to be 10-pound test held 9.7 pounds at the knot! Floating – Nylon isn’t particularly dense material, and it tends to sink very slowly. That can be an advantage when fishing top water, for instance, but it’s not ideal in all situations and for all techniques. Memory – Monofilament “remembers” the shape of the spool, and especially on ultralight reels or in heavier weights, this can lead to line twist. Absorbs water – Mono absorbs water. As Berkley notes, this means that it will get a little easier to handle, cast, and tie as it loses much of its memory. But it will also encourage even more stretch. Low sensitivity – If mono has a real weakness, it’s low sensitivity. Because it stretches well and isn’t very dense, mono can make it hard to detect bites and feel details, especially if you have a lot of line between your rod and lure. On this front, both braid and fluorocarbon are superior. Nylon monofilament has a lot of strengths, and there are a ton of situations where it’s an awesome choice. Topwater – Mono’s propensity for slow-sinking is ideal of topwater applications. And when you add its incredible shock strength to the mix, you have an ideal combination for aggressive strikes on topwater lures. 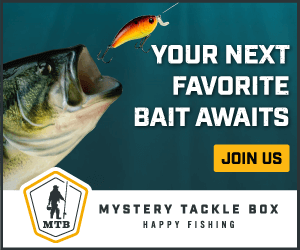 Treble hooked lures – You don’t need a ton of force to set a treble hook. Indeed, too much power on the hookset is a problem that’s solved by mono’s stretch. And while it’s not ideal for some applications, we like to run it with positively buoyant treble hooked lures like Rapala’s Original Floater. When we need abrasion resistance and casting distance – All things being equal, mono generally outcasts comparable fluorocarbon, while offering better abrasion resistance than either fluorocarbon or braid. When we need long casts and high abrasion resistance, we reach for mono! When we need stretch and shock strength and are worried about knot integrity with a leader – One solution to running braid as main line is to attach a length of fluorocarbon or nylon monofilament leader. But every knot is a failure waiting to happen, especially with braided superlines. When we need stretch and shock strength, and want to avoid a potential problem, we spool on an excellent mono and fish with confidence. When we don’t have a lot of money to spend – Let’s be honest. For every bass angler with a slew of rods and reels, an expensive boat, and every lure in Bass Pro, there’s a guy who’s got a tight budget. Fluorocarbon and braid are expensive line choices, and most of the time, a good mono can get the job done for a fraction of the price. That’s something we appreciate about nylon monofilament, and we think you will, too! A key advantage of mono is that it’s easy to use, and there are very few problems you’ll need to keep in mind. Store it out of the sun – Nylon isn’t UV resistant, and leaving your reels and line in the sun when you store them will quickly degrade its integrity. Always store your gear inside, out of the sun, when not in use. Fix line twist – If you find that your line is twisting as it leaves the spool, there’s a simple fix. Loop it over a tree branch, stick, fence post, or friend, and start walking. Strip all the line from the spool, and then reel it back in under slight tension near the reel. That will allow the line to untwist and re-spool with less memory. We already know the advantages of mono: shock strength, stretch, low-visibility, abrasion resistance, and knot integrity. We like to double-down on these while still looking for low memory, excellent casting, and as much sensitivity as we can get. Stren Original has been around for a very long time, and many anglers tied their first knots with it. Since then, more than a few have shelved the Stren for fluorocarbon and braid, but this mono deserves a closer look. Available in both low- and high-vis options, as well as fluorescent for night fishing, there’s a color for nearly any condition. Clear and Low-Vis Green are always solid choices, and with Hi-Vis gold for nymphing or aging eyes, Stren has its bases covered. Stren Original really shines when abrasion is an issue, and more than a few fishermen have discovered that it makes excellent leader material for braid. That says a lot right there, and this was confirmed by SaltStrong. In a four-way head-to-head, Stren Original proved the toughest! Stren’s line is pretty limp, leading to amazing casts, and it ties easily–as you’d expect. Its sensitivity was something of another surprise top us. We find that Stren is pretty good at detecting light strikes even with a lot of line in the water. While it’s not going to offer slack-line sensitivity to rival fluorocarbon, we weren’t disappointed and don’t think you will be either! 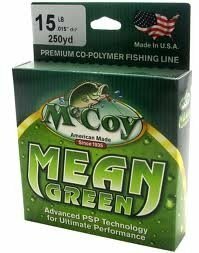 McCoy’s Mean Green is a copolymer monofilament that’s hard to beat. Combining all the strengths you’d expect from mono, and avoiding many of its weaknesses, you can count us as impressed! Don’t let its name fool you: while this line is available in Mean Green, it’s also offered in Clear Blue Fluorescent and Xtra Clear. That Clear Blue is designed to glow in blacklight, making it an exceptional choice for night fishing. Mean Green does an admirable job disappearing into water that’s stained or murky, and we like Xtra Clear when we can see the bottom. Speaking of casting, McCoy’s Mean Green is extremely limp, especially in the lower tests. As a result, it has almost no memory. That leads to some awesome casts. Of course, it knots easily, too. Abrasion resistance is excellent, and we wouldn’t be afraid to run Mean Green where we expect a lot of contact with pilings, stumps, rocks, or shells. 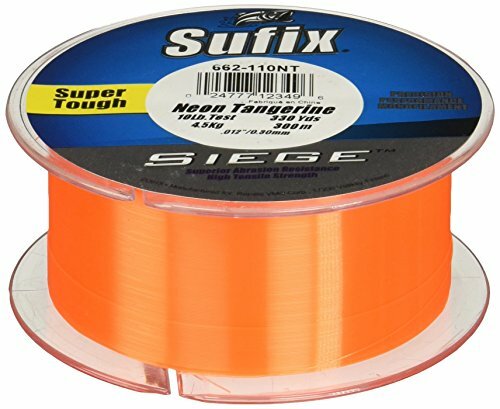 Sufix Siege is a popular monofilament for a reason: it performs beautifully, providing everything you expect from quality mono. Siege is available in a range of colors that we like. From Clear to Camo to Smoke Green, you’ll find this line flat disappears in water. And if you need high-visibility, Neon Tangerine’s a great choice. Unfortunately, if you’re a night angler, you’ll need to look elsewhere for a fluorescent option. Siege is extruded and wound to prevent memory, and we find it to be plenty limp and easy to cast and handle. Knotting is as easy as you’d think; expect no trouble there. In terms of abrasion resistance, Siege stands up to abuse well, though Stren is hard to beat on this front. The Siege’s sensitivity is about average for mono. 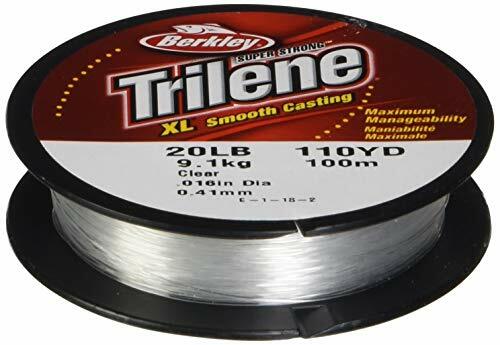 If you need heavy-weight mono, Trilene Big Game delivers. 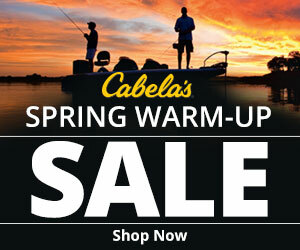 Whether you’re tackling striped bass or redfish, monster catfish or lake trout, this is line that won’t disappoint. Big Game’s color palette offers nearly invisible options, but don’t expect high-visibility or fluorescent choices. That said, these are proven colors that blend into the background in a wide variety of conditions, as many saltwater anglers know really well! 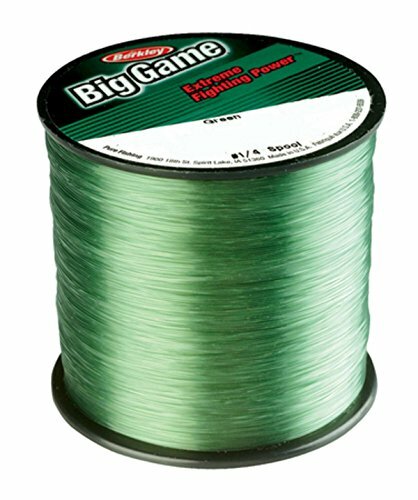 Plenty of fishermen have used this instead of the much more expensive fluorocarbon options, and the fish don’t seem able to see Big Game. Knot strength is excellent, and even in heavy weights, it’s easy to tie. Admirably limp and low on memory, it casts well, too. Especially as you move up in weight, and thus in diameter, Trilene Big Game gets very, very abrasion resistant. For large fish putting up a fight near reefs and rocks, you probably can’t find a better product. Trilene XL is well known to many anglers, and that XL–extra limp–isn’t just marketing hype. Give this line a try, and you’ll be as impressed as we were. Trilene XL isn’t available in many colors, but Clear and Low-Vis Green take care of most situations where you need your line to blend with the water. And while they don’t offer a high-visibility option for things like nymphing, they do provide a fluorescent choice for night fishing. As its name suggests, Trilene XL offers anglers a very limp line with low memory. It casts extremely well, knots easily, and doesn’t cause any trouble unless you leave it on a small spinning spool for a very long time. We don’t recommend you do that with any line, so this is hardly a point to quibble over, and if you take care to respool or at least get the kinks out, you’ll have no problems. It’s tough stuff, too, and reasonably abrasion resistant. While not at the top of our list, it’ll deliver, especially in the heavier weights. Surprisingly, we didn’t feel like we lost much sensitivity when running Trilene XL. That said, it’s not braid. I’ve used this line a lot, and while it’s not my favorite, it’s a solid, dependable choice for long casts. 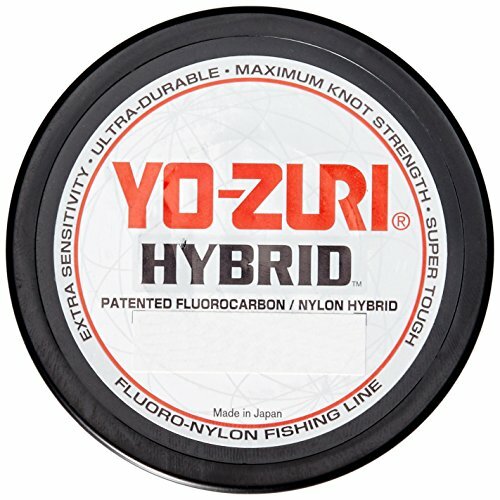 Yo-Zuri Hybrid is a copolymer line that fuses traditional nylon with fluorocarbon, and if you believe the marketing hype, it offers the best of both worlds. Because of the fluorocarbon used in its composition, this line is only available in clear. That leaves night anglers and fishermen who need a high-visibility option in the dark. Nevertheless, clear is a great choice if you only get one color! The addition of fluorocarbon prevents this line from absorbing water, and that added density increases its natural sensitivity. Of the lines we review, this is the best performer in this category, and if that’s the only thing keeping you from trying mono again, Yo-Zuri’s Hybrid is something you should consider. Casting and knotting suffer, however, as you would expect from fluorocarbon. In careful testing, this hybrid started to experience knot failure at about 65 percent of its tested tensile strength. And the added stiffness of fluorocarbon is doing this line no favors when it comes to memory, either. Of the lines we reviewed, this is the worst casting. Overall, this is probably a poor compromise, and with the exception of sensitivity and UV resistance, the other products we reviewed are superior. Our Pick – Stren Original! For some anglers, monofilament has been eclipsed by improvements in braided and fluorocarbon lines. But those in the know realize that in many situations, mono is still the best choice. Our favorite is a surprise winner–Stren Original. While it’s been around for a very long time, Stren delivers the goods. Incredibly abrasion resistant, sensitive, long-casting, and easy to tie, there’s a lot to love about this inexpensive performer. It narrowly edges out McCoy’s Mean Green because of its superior color options, and for most anglers most of the time, Stren Original is an outstanding choice. But if you need a real heavy-weight, we recommend Trilene Big Game. Available in super-strong tests, when you’re fishing for monsters, this is a tough choice to beat. 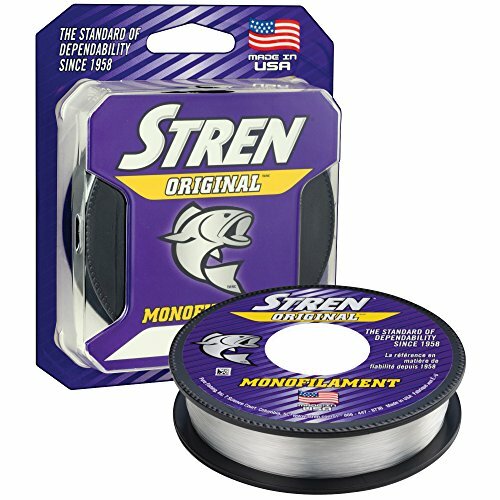 Give monofilament fishing line a try again. You won’t be disappointed! Let us know what you think! We look forward to hearing from you!